Now in it’s 15th year, the Rotman International Trading Competition (RITC) provides a three-day simulated market challenge. 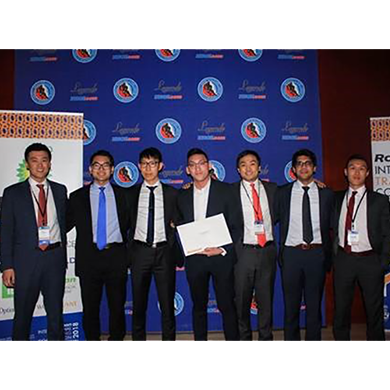 Taking business case competitions to the next level, this year’s prestigious RITC attracted more than 420 students representing 51 universities from across Canada, the United States, Europe, Africa and Asia. This was the seventh time a team represented the Lazaridis School of Business and Economics at RITC and the first time our students took home silver. Over the course of the competition, the student teams participate in various trading and finance case scenarios, relying on simulation software to execute their trades. The RITC attracts many leading business schools, including Princeton, Duke and Cornell. The success of this year’s team underscores the strength of the Lazaridis School’s immersive education. This year’s Lazaridis School team was comprised of six students: Raman Arora (Double Degree BBA/UW Computer Science), Charles Zhao (Double Degree BBA/UW BMath), Jesse Liu (Double Degree BBA/Financial Math), Wayne Wong (Double Degree BBA/UW Computer Science), Tim Yang (Double Degree BBA/UW BMath) and Randy Zhu (Double Degree BBA/UW BMath). The team met in Dr. Shiklko’s class, and with the help of last year’s Lazaridis School participants, they set their sights on making an impact at the RITC. Alumnus Wills Iyer, (Double Degree BBA/UW Math ’17) was instrumental in the team’s second-place finish.